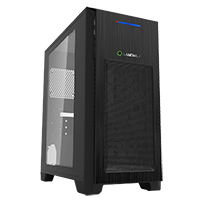 The Game Max Mini Kallis is a compact case designed for maximum cooling. The cooling system allows for up to 6 x 120mm fans, or 3 x 120mm fans and a 240mm water cooling radiator. 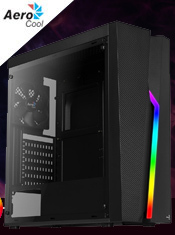 The dual layer internal layout gives excellent cooling with maximum component support, supporting Micro ATX and Mini iTX motherboards and up to 4 x HDDs (2 x 2.5" & 2 x 3.5" or 4 x 2.5"). The side window and black powder coating to the interior allows the user to install LED lighting to give a unique look to their system, whilst the internal cable management system keeps most of the internal cables hidden, to aid in increased airflow and keep the system looking clean and tidy. Don't let the compact size fool you this little one handles full size components while still offering roomy installation space. 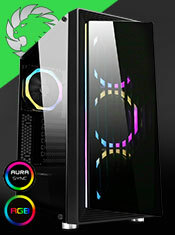 Compact and stylish design - Compact micro gaming chassis design. Dual layer internal layout - For optimised maximum airflow or advanced water-cooling configurations. Water cooling support - 240mm water cooling support or 3 x 120mm fan cooling on the front. GPU and CPU Support - Support 340mm VGA card and 155mm CPU cooler.